Notorious for the obscurity of his writing (known only from 100+ fragments) Heraclitus has had a profound impact on Western philosophy, and his thought seems particularly relevant to life in the twenty-first century. 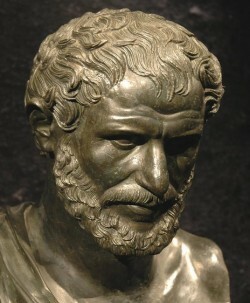 There are a few key features of Heraclitus’s thinking: that everything is in flux, like the constant flow of a river; that ‘all things are one’; and that all arguments, judgments and views are relative. The most thorough outline of Epicurus’ thought is in Lucretius’ epic poem, De rerum natura (On the Nature of Things – c.50BCE). 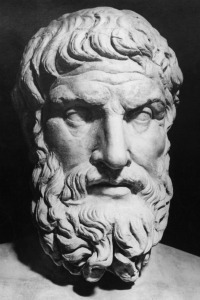 Epicurus takes a theory about atoms, first suggested by Democritus (c.460-c.370), and develops it into an eloquent theory of how the universe is structured. In order to be brief, I’ll list a few of the most significant features of Epicurus’ thought – as described by Lucretius. All things come into being as a result of a ‘swerve’ – leading to collisions of atoms that generate endlessly variable forms – nothing is predetermined (eg. by fate or gods). We can act as we wish within a framework of motion, chance and impermanence. Understanding how the world is, generates deep wonder. Note the affinities with Buddhist thought – and how Epicurus anticipates ideas and approaches found in modern science. Heraclitus by A. A. Long – in Routledge Encyclopedia of Philosophy, Vol 4, 1998. The Swerve by Stephen Greenblatt – Vintage, 2012 – excellent account of Lucretius/Epicurus.